(MAHWAH, N.J.) – November 7, 2013 – Today, Jaguar announced it will launch a new brand and product advertising campaign, themed "British Villains," for the launch of the new Jaguar F-TYPE Coupe. The campaign will include the brand's first television commercial produced for running in the broadcast of the Super Bowl. The ad is scheduled to have its broadcast debut on Fox during the 2nd half of Super Bowl XLVIII. Jaguar will debut the new F-TYPE Coupe, at the 2013 Los Angeles Auto Show and Tokyo Motor Show in November. Year-to-date through October, Jaguar sales have increased 36 percent in the United States, the highest growth in the industry. The campaign features a 30-second spot and a wide range of digital assets and executions and will play off the idea that Brits have long made the best villains in landmark films, combining intelligence with charm, restlessness with calm, and always confident. In the world of pop culture, villains disrupt the status quo and challenge the establishment, while living one step ahead of, and better than, the pack. The campaign asks the question, "Have you ever noticed how in Hollywood movies, all the villains are played by Brits?" It will launch with a unique hashtag, #GoodToBeBad, linking to the overall allure of the F-TYPE Coupe and British villains. The Jaguar campaign, which will feature renowned British actors, is being filmed by Academy Award-winning British film and television director Tom Hooper in London. "This is one of those jobs that can really be a lot of fun, so I was quite happy to oblige when Jaguar asked me to be a part of their first Super Bowl commercial," said Hooper. 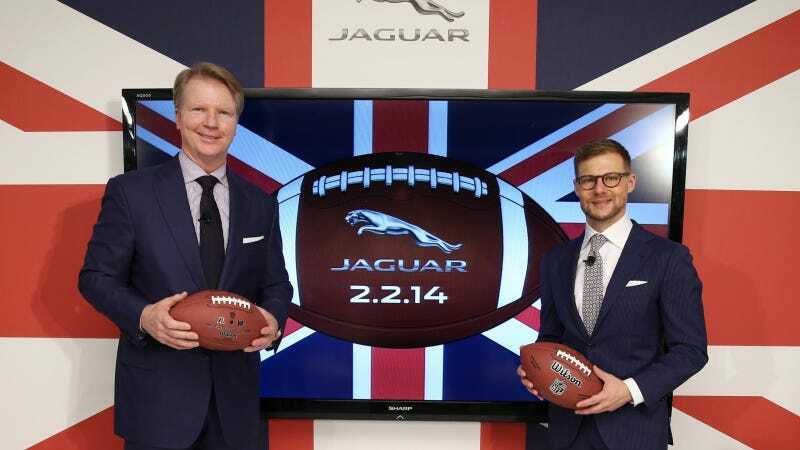 "The Super Bowl is a perfect advertising platform for Jaguar given our new products, fast growing sales in the U.S. and the renewed interest in British cultural icons," said Jeff Curry, Brand Vice President, Jaguar North America. "The campaign signals that the F-TYPE Coupe is the new British bad boy in the segment and is designed to disrupt the tradition-bound sports car market. We look forward to bringing the best of British film to the Super Bowl viewing audience with renowned actors and Academy Award-winner director Tom Hooper." Jaguar will make known its campaign intentions with an unusual ad that introduces the notion of a British luxury brand as a disruptive player and hints at the British Villain theme of the campaign. The spot, "Disruptor," was unveiled today by Jeff Curry at a news conference at The London NYC. The ad will air exclusively on November 10, during the 2013 British Academy of Film and Television Arts Los Angeles Jaguar Britannia Awards on BBC AMERICA, as well as during NFL games. A webcast of today's event will be available to view at www.interactivejaguar.com. Jaguar's debut commercial in the broadcast of the Super Bowl reflects the momentum the brand has achieved through its sales growth. It also follows the high-profile sponsorship announced earlier this month that Jaguar will elevate their presence in Hollywood by joining with the British Academy of Film and Television Arts Los Angeles (BAFTA LA) as the official 2013 title sponsor of the BAFTA LA JAGUAR BRITANNIA AWARDS.